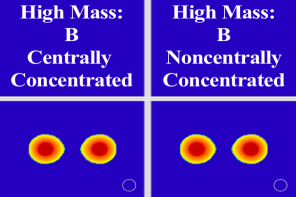 Here we compare the case M1616B0 (high mass) versus the case M1414B0 (low mass). 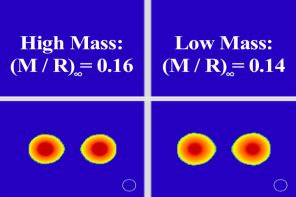 The high mass case ends with the formation of a black hole whereas the low mass case ends with the formation of a hypermassive neutron star. 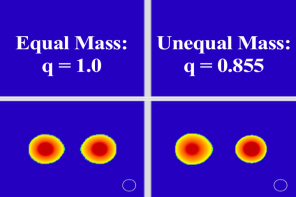 Here we compare the case M1616B0 (equal mass) versus the case M1418B0 (unequal mass). 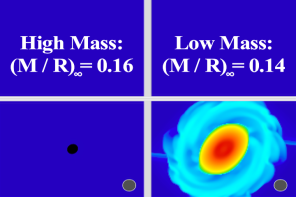 Both cases end with the formation of a black hole. 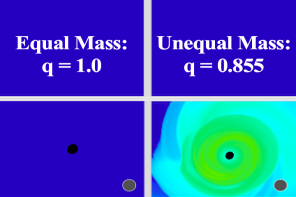 However the unequal case forms an appreciable disk around the black hole, while there is no disk in the equal mass case. Here we compare the case M1616B0 (nonmagnetic) versus the case M1616B1 (magnetic). Both end with the formation of a black hole and no disk forms in either case. 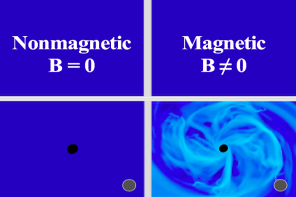 The magnetic field, however, delays the time in which matter falls into the black hole. 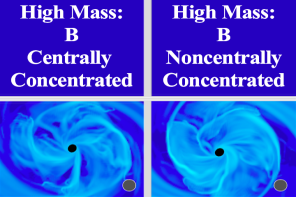 Here we compare the case M1616B1 (centrally concentrated magnetic fields) versus the case M1616B2 (noncentrally concentrated magnetic fields). Both end with the formation of a black hole and no disk forms in either case. 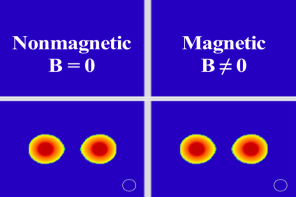 We saw that a magnetic field delays the time in which matter falls into the black hole when compared to the nonmagnetic case. A noncentrally concentrated magnetic field will delay this event even further.